We are within a few weeks of the anticipated initial emergence of grape root borer (GRB) adults here in Georgia. If you are planning on implementing mating disruption as a management tactic for GRB and you haven’t deployed your pheromone dispensers/ties, now is the time to get those distributed. 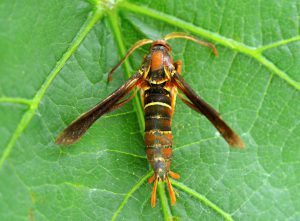 If you are unfamiliar with grape root borer (pictured above), GRB is a clearwing moth with larvae that tunnel into the larger roots and crown of grape vines and feed below the soil surface. Symptoms of infested vines include poor growth and fruit set, and potentially complete root girdling and vine death. As such grape root borer is a significantly destructive vineyard pest in southern grape production. Adult GRB are day flying moths that are reddish brown in color and resemble paper wasps, particularly when flying. The adults generally emerge late June or early July, mate, and then the females lay eggs on the soil surface, leaves, and weeds within eight days emerging. The eggs hatch in approximately two weeks and larvae immediately tunnel into the soil in search of grape roots. The larvae are cylindrical, cream-colored with a brown head, and 1.5 inches long when mature. The larvae spend nearly two years feeding within the roots. During the summer of the second year, larvae will pupate near the soil surface before emerging as adults. Grape root borer monitoring trap. 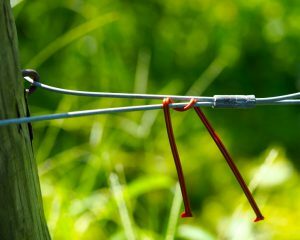 Because the adults and the larvae often go unnoticed until the vine begins to decline, management can be a little tricky. 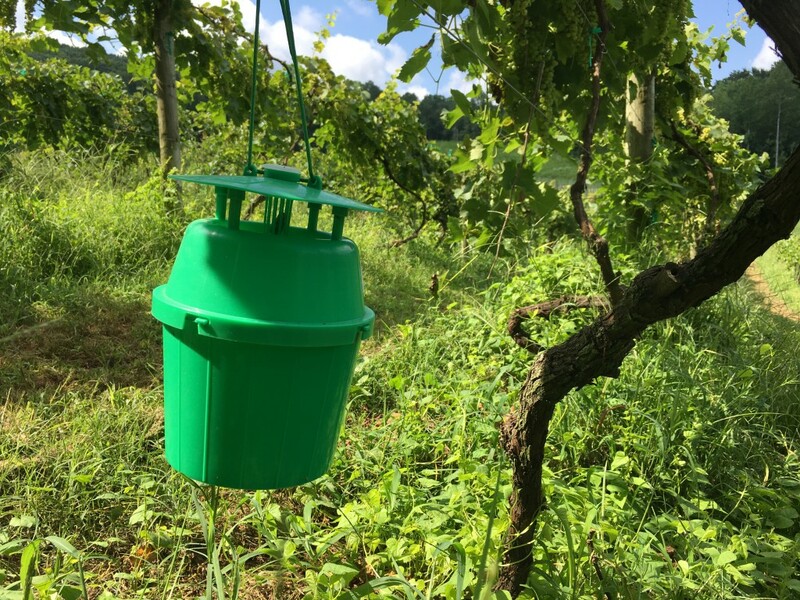 Fortunately, GRB adults can be monitored using a simple bucket trap and pheromone (pictured above). Traps and pheromone can be purchased from sites like Great Lakes IPM* and assembly instructions can be found here. The abundance of moths captured on a weekly basis can be used to determine both presence of grape root borer in your vineyard and to determine peak activity periods, which will be used to time management activities. One preemptive management strategy is weed control. Eliminating weeds around the base of vines reduces the sites for egg laying and improves spray coverage for GRB management. Pheromone dispenser for grape root borer mating disruption. Another management strategy is called, “mating disruption.” Through the deployment of pheromone-filled dispensers (pictured above) within your vineyard, mating disruption works by making it difficult for males to find females to mate, and without mated females, there are no new larvae to attack the vines. The entire vineyard needs to be under mating disruption for at least two years, but after two years of use, it is really effective at reducing the GRB within the vineyard. The mating disruption (Isomate GRB) can be purchased through Helena Chemical Co (828-685-1182). In terms of chemical management, Lorsban (chlorpyrifos) is the only insecticide labeled for control of GRB. This treatment is applied directly to the ground and base of the vine under the trellis wire at least 35 days prior to harvest. The insecticide must target the emerging and egg-laying adults, thus applying Lorsban late June to early July does a reasonably good job at managing grape root borer. Note: do not allow this spray to contact the fruit or foliage. Mounding is an alternative management strategy that involves placing mounds of dirt, approximately 10 inches deep, around the base of each of the vines (rather than Lorsban) mid- to late June. This basically makes it hard for the adults to emerge from under the soil and also removes the main area for the females to lay eggs. Research has shown that mounding can reduce adult emergence by up to 90% (Sarai 1969), but is labor-intensive. After August, the mounded dirt should be removed from the base of the vines. The last management strategy is the use of entomopathogenic nematodes. These are beneficial round worms that are able to kill soil-dwelling insects. Commercially available species, such as Heterorhabditis bacteriophora and Heterorhabditis megidis, have been shown to effecting kill GRB larvae and are available from sources, such as Arbco Organics*. The nematodes can be applied with standard spray equipment as a drench to the base of the vines, and once in the soil, the nematodes will seek out and can kill the GRB larvae, even after they tunnel into the roots. Unfortunately this is an expensive approach that works best when the soil is moist and must be re-applied annually, but when done correctly can be as effective as Lorsban (Said et al. 2015). There is no silver bullet for GRB and each strategy has its limitations, so if you have any questions about the management strategies discussed here, please let me know. Also, please refer to the Southern Region Small Fruits Consortium for management strategies for GRB in Georgia. Posted in Bunch Grapes, Muscadine Grapes, Pest management Guidelines, Uncategorized. This entry was tagged grape root borer. Bookmark the permalink.